Please Touch Museum: This is a kid’s museum/play area in Philadelphia. My undergrad friends (3 families with six kids) met here for an overnight trip. It is not a museum as much as it is a play area for kids. 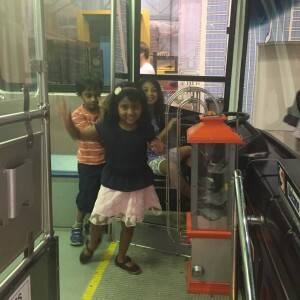 There are different zones: a water play area, a train station, a construction site, a bus terminal, a food mart, a fairy tale maze , a painting corner– each of which could keep the kids engaged for a long time. For me, the biggest plus of this place was that each & every zone had a special corner to accommodate infants & toddlers – so both kids could play nearby – if not together. 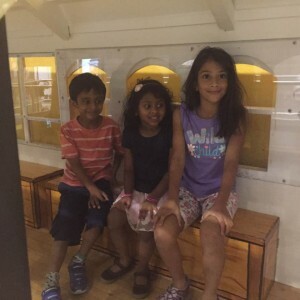 Most of the kids were Annika’s age – so she did have a great time with friends. They also have a carousel so both kids had multiple rides and they ended the day with a performance from a jester with the kids following him about like Pied Piper. There were multiple theatre shows that the kids can attend throughout the day. All in all, it was well worth the $20 admission fee for the entire day. The adults had a great time too. We were joined by another friend and his wife who were local and we proceeded to chat for half the night – we had a great time catching up. 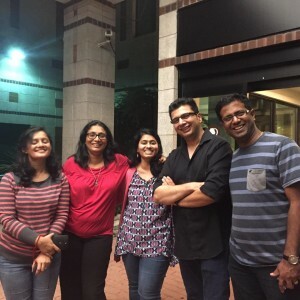 This was the fourth year we were meeting up and it has been a tradition that is well worth carrying on! But the highlight of the trip happened the day before. 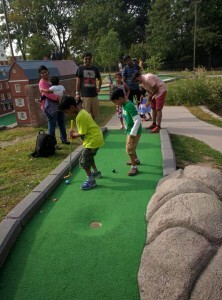 The kids had been playing for the better part of the day at a local park /mini golf course – it was hot. We headed to the visitors center for a quick biobreaks and snack. After that we packed up and were about to cross the street to get to the Big Bell when the road was set upon by bikers. Not the leather clad goateed sort in their Harleys but naked folks riding their bicycle. It was the day of the annual naked philly bike ride . Tons of men and women all ages were riding their bikes in the buff to raise consciousness regarding fuel consumption. We waited for some time hoping that they will pass soon and we could cross the street but the they went on and on and on – for a good 15-20 minutes. To say that we were flabbergasted was to put in mildly. If it started 5 minutes, later we would have crossed the street and would be safely inside the Bell museum and would have totally missed it. I thought the kids would have some questions but they seem to take it in their stride. Parents tried hard not to react visibly but we also had some grandparents with us who prudently moved to behind the building. It was some reunion!! 2 . 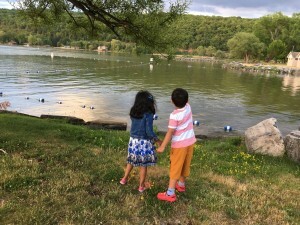 Finger Lakes: During the 10 day east coast road trip with my sister, we took a break at upstate New York at Finger Lakes region. 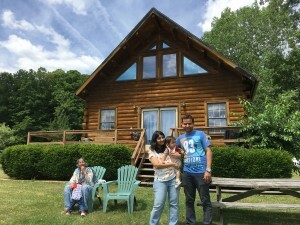 Through vrbo.com we booked a little log house to stay for two nights near Keuka lake, aptly called “A Beautiful Place”. 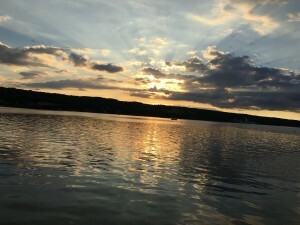 The finger lakes region has a series on long thin lakes each like a finger. The house had a big fenced in play area, a breathtaking view of the lake and picturesque loft with twin beds that made it straight out of a story book. The finger lakes regions is known for its wine and cheese. We visited a working dairy farm – where the owner told us all about the cheese making process and the kids could actually see a barn where rows and rows of cows were housed. The cheese was truly amazing – fresh and flavorful. We bought more than we could eat on the road. We also spent some time lakeside, where the kids good use the play area and got some beautiful sunset pictures. But the highlight was the Seneca Farms Creamery – kitschy place filled with old Coca cola memorabilia but serving the most wonderful ice-creams. It was truly an oasis amongst the frenetic pace of a 10 day road trip. We had visited most of the touristy places in Dubai during our last visit but this year’s visit coincided with Dubai’s Global Village . Billed as a cultural extravaganza, it is a pretty much a open air market place for different regions to sell stuff. Dubai is a perfect place to host this kind of event because as I mentioned earlier, there are so many nationalities of people living here. Its almost like Epcot (Disney) And as befits Dubai, the extravaganza part is only too true – its just a huge shopping one. There are large pavilions each for different countries – India, China, USA and Indonesia and so on. One thing that was apparent to me (as one living in geographically unaware United States) is that Arab countries were all separate – separate stalls for Lebanon and UAE and Yemen and similarly Africa was treated as a continent with separate stalls for Tunisia and Sudan and Egypt. The pavilions are big – each containing stalls for food items and clothing and other local specialties. I am not sure authenticity was one of the underlying principles while developing the concept. The American pavilion sold things that I had never seen in America – including nighties , chappals and some weird clothes that might have been popular in 1800s America. The best feature of course was Fried Ice-cream. Having had fried icecream in US (albiet in Mexican restaurants), I was suitably enthusiastic and managed to convince Dwiti as well. So we ordered two and waited for the shop owner to showcase his skills. He kept up with a steady patter of words as he mixed the ice-cream and fresh strawberry and cream and rolled it all together on a flat cold surface. We watch every move not wanting to miss seeing how he fries it. The vendor how asks our name and proceeds to write that using chocolate sauce…we wonder how that will appear fried. He mixes the whole thing again destroying the name and then scoops it all up and hands it to us in a bowl. But we complain – where is the fried part? Which was apparently enough to launch him to a huge rant about how he made this yummy ice-cream and we are complaining instead of eating it. We apologized hastily and giggled our way outside eating distinctly non fried ice-cream. China pavilion for cheap knock offs. I got a LV knock off bag . Turkish pavilion – the street food was awesome.